Months before the compilation of D.A. 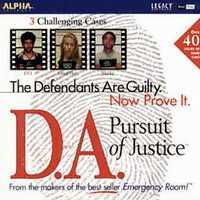 Pursuit of Justice was available on retail shelves, Legacy Software sold its 3 cases separately for on-line ordering only. This is one of those cases and shipped on 2 CD-ROM discs. You play a California Assistant District Attorney. The police have gathered enough evidence to make an arrest .. but you must be able to prove, in court, that a crime has indeed been committed and that the person on trial committed that crime. In interactive movie fashion, you'll control your character's actions by mouse in first person. The game features still shots in combination with FMV scenes, a full musical score and real actors and actresses. The Sunset Boulevard Deuce case sounds like a simple DUI (Driving Under the Influence) based upon what the police came up with so far - an open wine bottle, high Blood Alcohol content and several eyewitnesses. You only have 4 days to get your act together. Of course, as your investigation continues, you find it's not as cut and dry as it seemed at first glance. During the course of the game, you are able to travel to various locations (i.e. the police station, law library, locations of witnesses) and work in your own office. Everything you need to build your case is on hand. Use your trusty digital camera and legal notebook (computer) to research law, get advice, send evidence to the lab, and analyze test results. Put all the pieces together in the "Case Constructor" which is arranged by departments. When you're ready, go to court where you will present your case, interrogate witnesses on the stand, make objections and closing arguments. If you've done your job, there'll be a new inmate in the State Pen. Make a mistake and they'll go free.